Become a happier and more successful you! When will you meet your soulmate? Will you ever get married and have children? How should you best solve the problems at work? Are you feeling lost and alone? 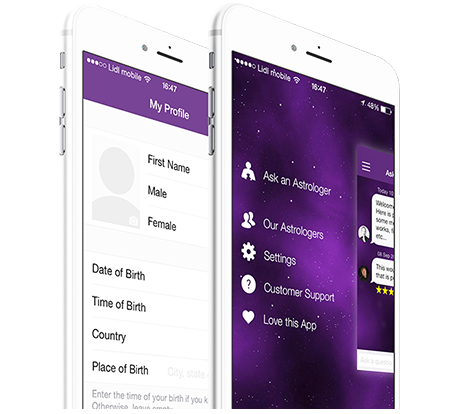 My Astrologer App is an easy to use way to connect to your Vedic astrologer and ask those important questions that seem to just not let your mind free! Our mission is to help you become as happy and successful as you dream to be. Our astrologers are trained in Vedic astrology and will provide you with advice based on your birth chart. Make positive changes in your life guided by your own astronomical data. Free Predictions made by real astrologers based on your birth chart. Connect with your personal Vedic astrologer. Receive answers to your questions. 100% ease of use: no appointments or long telephone calls. Our astrologers are available anywhere, anytime. Privacy: The confidentiality of your information is guaranteed. You can also lock this app with your personal pin number. We welcome all your feedback including technical issues or your suggestions on how to improve your experience. Please click here to e-mail us. Your comments are important to us. Email Now | need help? © 2014 ESolutions Group. All Rights Reserved.